Salisbury, NC - Randall Metals Corporation, a multi-facility flat rolled metal service center specializing in the processing and distribution of precise-tolerance cold rolled, pre-painted, galvanized, tinplate, and long terne sheet and coil, has installed an Ultra-Precision High-Speed Single-Loop Turret Head™ Slitting Line in its expanded Salisbury, NC, facility. 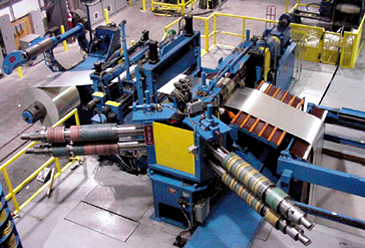 The new slitting line, manufactured by Braner/Loopco, Schiller Park, IL, is designed to process 45,000# x 62" wide coils in gauges from .006" through .075" at slitting speeds to 1,200 FPM. The slitting line handles 16" and 20" ID x 72" OD master coils, and produces slit coils with 16" and 20" IDs with coil ODs to 72". 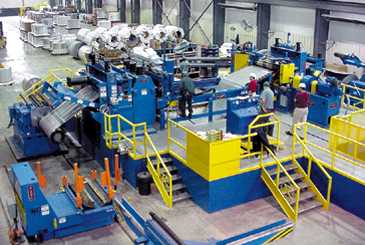 High Pass Line: The new Randall Metals slitting line employs the high pass line slitting line arrangement, a technological advancement over the older floor level slitting lines. In comparison with floor level slitting lines, high pass line slitters offer faster coil threading, improved coil tracking, and improved slit coil side-wall registration, while occupying significantly less floor space. The Recoiler and Uncoiler are installed at floor level, while all equipment between is elevated to match the largest coil OD. This concept eliminates reverse bending of the strip against the natural coil-set as the coil is processed, and because the strip is never reverset bent, strip threading is quick and coil-breaks generated from reverse strip bending are eliminated. Product quality is improved with the elimination of deflector/pass line roll induced strip surface scuffing and scratching because all deflector rolls are positioned below the strip, not above, therefore deflector/pass line rolls never contact the top of the strip. Ultra-Precision Turret Head™ Slitter: The Braner/Loopco exclusive Turret Head™ Slitter is equipped with three (3) quick-change ultra-precision slitter heads that allow Randall Metals to consistently produce close-tolerance light-gauge slit coil. The unique Turret Head™ design features unobstructed access to the slitter arbors, which makes tooling loading and unloading easier and faster. Re-tooled slitter heads can be exhanged in less than two minutes. The Turret Slitter is powered by a 125 HP-DC drive that allows full loop slitting of all gauges from .006" through .075". Pushbutton Tooling Lock-Up: The Randall Metals slitter is equipped with a feature that locks the tooling onto the slitter arbors with pushbutton activated hydraulic locking bars rather than threaded locknuts. The Pushbutton Tooling Lock-up feature reduces re-tooling time by eliminating the time-consuming task of loading and threading locknuts onto the arbors. In addition, thread maintenance, broken grease fittings, and sloppy grease guns are completely eliminated.